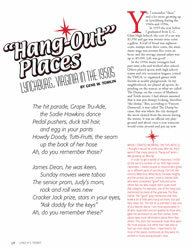 Yes, I remember “these” and a lot more growing up in Lynchburg during the 1940s and 1950s. In 1955 the year before I graduated from E. C. Glass High School, the cost of a car was $1,950 and gas was twenty-nine cents a gallon. A loaf of bread was eighteen cents, stamps were three cents, the minimum wage was seventy-five cents an hour, and the average annual salary was up to $5,000. Life was good! Gene W. Tomlin is a Lynchburg native and lifelong history buff. After graduating from Lynchburg College in 1960, he spent the next thirty-five years as a professional YMCA director, serving associations in Florida, Tennessee, Alabama, Kentucky, California, and South Carolina. He moved back to Lynchburg in 2002 and is really enjoying rediscovering his hometown.